A financial market comprising of a certain number of distinct companies is considered, and the following statement is proved: either a specific agent will surely beat the whole market unconditionally in the long run, or (and this “or” is not exclusive) all the capital of the market will accumulate in one company. Thus, absence of any “free unbounded lunches relative to the total capital” opportunities lead to the most dramatic failure of diversity in the market: one company takes over all other until the end of time. In order to prove this, we introduce the notion of perfectly balanced markets, which is an equilibrium state in which the relative capitalization of each company is a martingale under the physical probability. 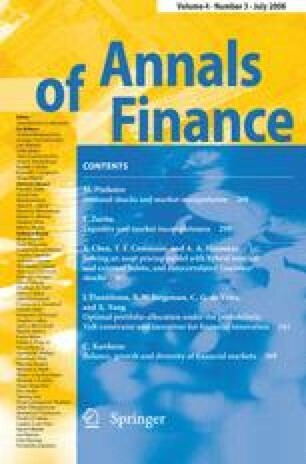 Then, the weaker notion of balanced markets is discussed where the martingale property of the relative capitalizations holds only approximately, we show how these concepts relate to growth-optimality and efficiency of the market, as well as how we can infer a shadow interest rate that is implied in the economy in the absence of a bank.